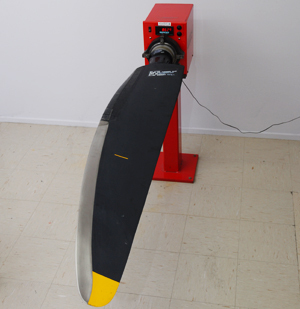 When ACS first started in the 1990s repairing and overhauling Hamilton Sundstrand composite propellers, the common problem for operators was the inability to interchange blades due to inaccurate moment balance. The cause of the problem was the inherent inaccuracy of mechanical balancers and ACS embarked on a project to design, develop and manufacture a high accuracy digital balancer. Initial testing was very positive and the design evolved into model ACS-3 which provided an accuracy of +/- 0.05%. After balancing a number of blades customers reported a major improvement in blade interchangeability and very much improved dynamic balance. The ACS-3 digital balancer was approved for 14SF and 14RF blades by Hamilton Sundstrand in 1999 and is being incorporated in the manuals as they are re issued. The digital balancer system does not rely upon mechanical master blades as reference standards but uses master moments i.e. a number. Hamilton Sundstrand specified the master moment for each blade type (expressed as inch pounds or gram meter). The digital balancer provides a direct reading of the actual moment and blades are balanced to the master moment. Blades can not only be balanced very accurately but also the compliance with the balance tolerance can be verified. The use of actual master moments eliminates the need for calibration blades. 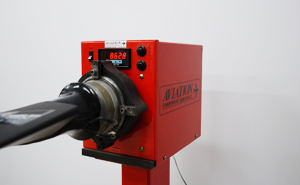 The digital balancer is supplied with a calibration system for quick calibration and verification of the balancer accuracy. The calibration of the elements of the calibration system are traceable back to international standards for weight and length. Maintenance workshops will find the digital balancer very useful during repair of blades with the facility to accurately control the blade moment during the repair process. Although the ACS-3 was developed for large composite blades the balancer is available in other models to suit a variety of blades. The ACS-3 balancer has been used by ACS for over 12 years and has allowed customers to interchange blades without problems and also dynamic balance propellers much quicker and more accurately resulting reduced maintenance costs and in smoother running propellers.